The cost is only $35.00 per couple. The dance is alcohol free, but offers non-alcoholic beverages and a light lunch. Westview Dance Club is a not-for-profit organization that promotes social ballroom dancing for couples. Classes range from beginners to advanced and feature Waltz, Fox Trot, Cha Cha, Tango, Rumba and Swing. 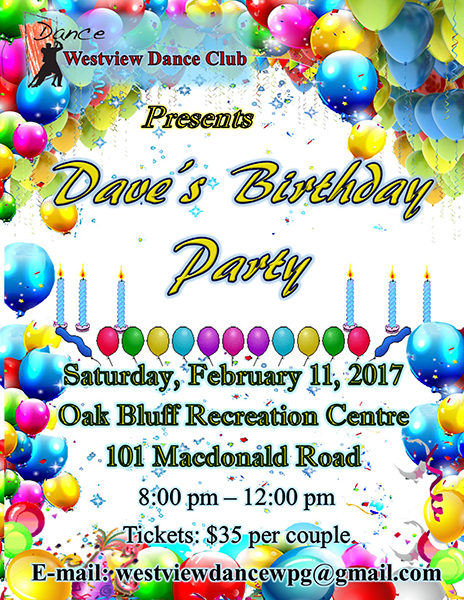 Now is the time to grab your dance partner and join us as we celebrate Dave’s Birthday Party the only way we know how; on the dance floor. Westview Dance Club: Promoting an active lifestyle through lifelong learning in social ballroom dancing in a friendly and supportive community.